An image of the Gateway Arch, pre-renovation. SPACE Architecture + Design has been hired by the nation’s largest fast food chain to renovate and expand St. Louis’ monumental Gateway Arch. “It’s still a little hush-hush,” said SPACE Captain Tom Niemeier, “but let’s just say we’re going to double the size of the existing Arch and paint it a stunning yellow-gold. Also, a crap-ton of yellow neon will be a prominent design feature.” The renovation will feature a new burger-themed museum, a diorama of the company’s cuddly burger-shilling characters, a restaurant, and up to 30 conveniently-placed defibrillator stations. 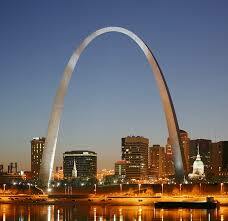 The new leg of the Arch will be located to the north of the existing Eero Saarinen-designed masterpiece. (“Saarinen, Schmaarinen,” Niemeier said. “He was such a short-sighted chump anyway. We’ll fix it for him.”) Both arches will be fitted with rocket-ship shaped clown-themed elevator cars that include televisions advertising the chain’s deep-fried “chicken” chunks and crappy meals for the tots. Sources say the fast food magnate – who, incidentally, has cornered the market on red hair dye and lipstick – acquired the riverfront property during some behind-the-scenes negotiations during the Arch grounds renovation project. An unnamed executive from the fast food corporation revealed, “We made a generous donation to the grounds renovation. They threw in the Arch for free if we spiffed up the place a little. Said we could do whatever we wanted. We think middle America is a great spot to have our company’s largest sign. Robble robble. Wait, take out that last bit.” The burger peddler’s market research confirmed that SPACE employees were overwhelmingly the largest consumers of their products in the St. Louis area, so it made sense for the international corporation to hire them. And they design a lot of restaurants, so that was going for them as well. “Holy crap, those guys can put away some burgers, and you better stay the hell outta their way when it’s [rib-flavored sandwich] season,” a big gelatinous purple guy in IT said while stuffing his gargantuan face hole with french fries. When asked about abandoning SPACE’s commitment to supporting local businesses and thoughtful urban planning, outspoken urbanist and architectural designer Jeremy Clagett said it was nothing more than “image and branding,” and something about St. Louis being a “third-rate city anyway.” He then proceeded to tear down Manchester in his brand-new Tesla.